The unique twist on the formula comes from the introduction of the game’s dreamy electronic soundtrack. While most shoot-em-ups allow you to grab powerups to modify the rate and density of your shots, here your bullets are different based on the rhythm of the music playing in each stage. Each bullet makes its own beat that enhances the soundtrack by adding another instrument to the background track. In the interesting but underplayed story, you control Poe, a young woman with the power to enter people’s dreams. However, the story is almost adjacent the actual gameplay; only by reading mission descriptions before entering each dream can you glean any plot details. In each level, you float through a cityscape and use your bullets and sword to dispatch nightmarish creatures that will flood the screen with their own shots. You can enlist the help of Ghosts, will-o-the-wisp-ish creatures that can be installed in Relics, which are on fixed points of the screen. The effect of doing this will vary depending on which Ghost is used and what kind of Relic it’s installed in. For example, the Mercy Ghost will heal you while the Anger Ghost will fire its own shots to assist you. On the other hand, the Loyalty Ghost will either freeze enemies or shoot lightning bolts depending on what kind of Relic it’s equipped on. Every action that occurs, whether by Poe, her Ghosts, or her enemies, adds some additional beats to the soundtrack. None of that would be interesting if A City Sleeps didn’t have a fantastic selection of music, Harmonix’s bread-and-butter. The fitting original techno tracks vary from airy synth songs to frantic dance beats depending on how hectic the action is. Even if you’re not a huge fan of electronic music, the effect of being able to add your own touch to the soundtrack makes dispatching foes feel extremely satisfying. 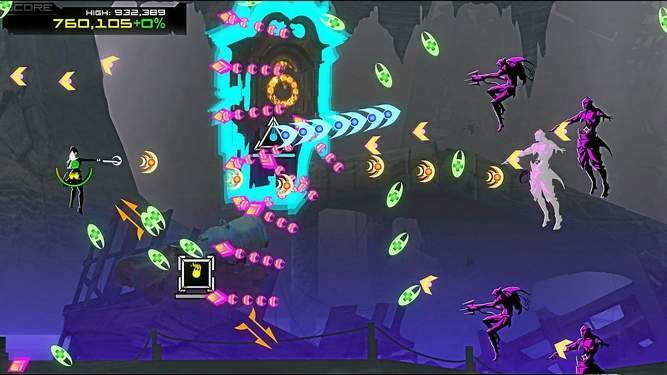 In some areas, the beat of the music will even inform how you dodge attacks, making you feel even more connected to the music. The boss themes are particularly intense and memorable. In A City Sleeps, you control Poe, a young woman with the power to enter people’s dreams, and her ghostly companions, each with their own personality and abilities. Unfortunately, there are only three bosses to fight, as there are only three separate stages. When the premise is so strong, its disappointing that there simply isn’t a lot of unique content to experience. Usually, I would welcome a game that can provide a good experience succinctly, but A City Sleeps ends before it really gets started. I would’ve loved a few more stages with their own songs and boss fights, and with such an interesting world, it’s strange that the story is only incidental to that. The five different difficulty settings are what adds meat to those three stages’ bones, but that also happens to be a sticking point. While I finished the first difficulty setting in about half an hour, the second difficulty setting is a harsh step up, and I struggled to beat even the first level. It matches the no-nonsense difficulty curve of older shoot-em-ups, but getting good requires playing the same three stages repeatedly until you learn enemy patterns and strategies cold. Unlike most “bullet hell” shooters, one hit will not kill Poe outright, at least not on the normal difficulties. But navigating the colorful world can feel overwhelming, and picking out your character among the ocean of neon bullets is sometimes a challenge in itself. Score hounds will get some mileage out of chasing their friends on the leaderboards, but just surviving each level will be enough of a challenge for most players. 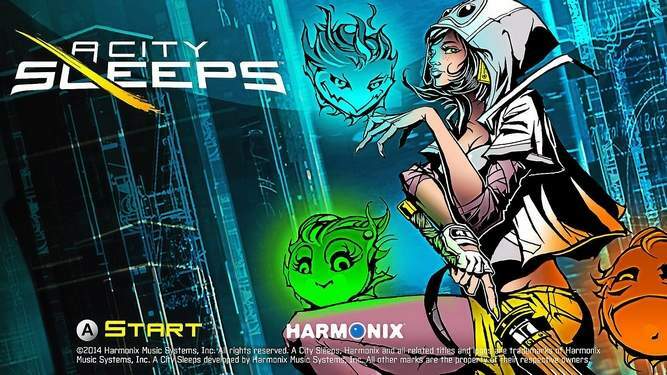 A City Sleeps was made with a small team, especially when compared to the massive efforts Harmonix has made in the past with its Rock Band series. Ultimately, A City Sleeps feels more like a proof of concept than a full game. I hope that Harmonix is willing to give a sequel a shot, because there’s a lot of potential here if they just take the resources to expound upon it. A City Sleeps is available on PC for $14.99. Developer Harmonix provided a review code for the purposes of this article.